Whitby Town midfielder Adam Gell has admitted to a sleepless night on Tuesday after his shock red card inside two minutes at the Turnbull Ground. 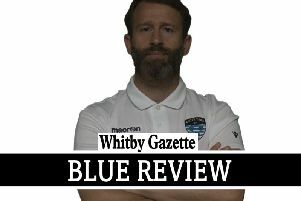 The midfielder saw red after just 75 seconds against Shaw Lane for an alleged elbow on Alex Burn, making it one of the fastest red cards in Whitby Town history. Gell, however, is distraught at the decision and is looking to make amends to his teammates and supporters alike. “I feel awful,” Gell told the Whitby Gazette. “I feel like I’ve let the lads down and that’s a big thing. It wasn’t intentional and I feel terrible. “On reflection, with 11 men on the pitch, we could have won that game. Tuesday was a sleepless night for me. The midfielder, whose ban kicks in for Tuesday’s visit to Lancaster City, is willing to work hard to get his place back in Chris Hardy’s side. “I know the quality in this squad,” Gell added. “I’ll have to work hard in training to get back in the team. Our combinations in midfield have been working but there are good players ready to come in.